We were looking through our thousands of photos this week and came upon this gem from summer. The boys are usually very tolerant of the countless photo shoots that are required of them. However, on this day they preferred to chill in the grass. 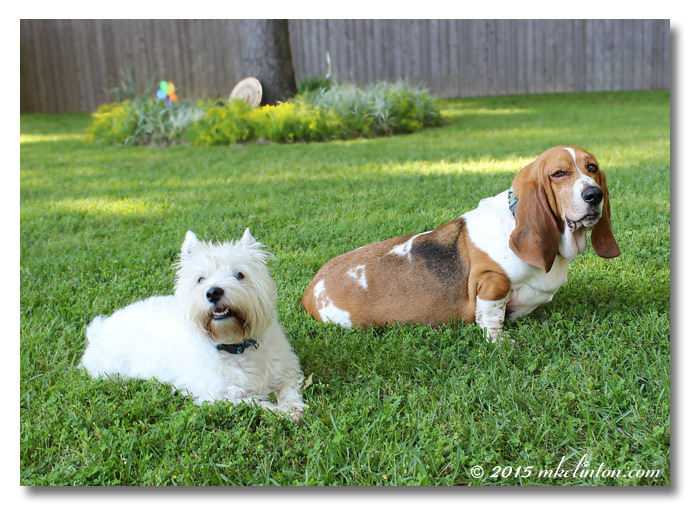 Bentley is showing his “Bassetude” with a gnarly stink eye while Pierre is doing some serious Terrier Trash Talking! It makes me wonder if they are Super Models or just Diva Dogs. Do your pets ever just say “No” to photos? Be sure to visit our friends posts listed below. We would say one is a super model and one is a diva...but we won't specify which is which! All the time! They are NOT good at modeling...Your two are naturals! The look on Bentley's face made me laugh out loud! When Ruby has had enough, she just stops listening and looks off in the distance and refuses to look at the camera. She's pretty patient, but when she's had enough, she's had enough. Bentley, don't worry! Mom and everyone who knows me says I'm a total diva dog, so there is nothing wrong with that. It is extremely rare that I say no to a photo. I even cooperated when I was pretty sick last month, but as you know, we models love the camera! As long as I have a pocket full of treats I never get refused. Sometimes the sheer excitement for a biscuit becomes a problem for getting them to sit still though. They are both, depends on the day. And yes glory and nellie say no to pictures and hate them. LOL, oh boy don't I know it!!! There have been times where I have been photographing Koda, and he will just lose patience all of the sudden and start howling at me LOL! Rock that a "Bassettude" Bentley! Cloudy is a Westie too! Hey to the boys! Hmmm I think Diva Dogs, don't know why. Only if there are NO treats. Mabel is pretty good at sitting for a photo, hazel gets all excited and wiggly, Bailey does not see the point at all! I would think they all are a little of both. I know Oz gives me the Terrier trash talk sometimes. Sometimes we roll our eyes and I refuse to sit. I think half of the photos I take of the Boston terrier involve her showing me the stink eye. Sigh. OMD OMD When will it be Summer again??? We love that Bassetude look. I'd say you have a bit of both making you all Super Diva Models! As long as there are treats everyone here but Bilbo is up for a photo shoot! Love the photo! I actually sit and pose and sometimes when momma is taking photos of others I will sit and pose. My adopted sister Daisy is another story - she literally looks away in every single photo. You cannot get her to look at a camera. You have to trick her! My dogs HATE the camera and me when I try to take a picture. Last year as a puppy Bailey put up with whatever hat or pose I had her do for photos, but this week when I put on her Santa hat she flipped it off her head and walked out of the room. DIVA. Bean always gives me a hard time, lol. I have to take so many pictures to get a good one. Well, if she is sleeping I get lots of good ones!! And I do have lots of Cocoa sleeping pictures. Wilson is my super model. He just "gets it". Now that he is mostly deaf, it's a tad harder but he still does a good job. Jimmy, on the other hand, hates to look directly at the camera 99% of the time. Kilo gets by on his cute looks. He loves photos now for a few minutes as he associates them with treats. He starts posing as soon as he sees a camera or phone. However he is only good with people he knows, he lacks patience and he demands payment up front. Rooney is clearly not a fan of some of our photoshoots! I think he is like "mom! knock it off"! !